It’s not like we didn’t pick up the Brompton brochure from Curbside Cycle weeks ago. We’ve been looking at it longingly, musing about which handlebars to pick, what gear ratios would serve us best, and whether the B Bag is worth the price. So many options! But that is the joy of getting one’s bike custom made. 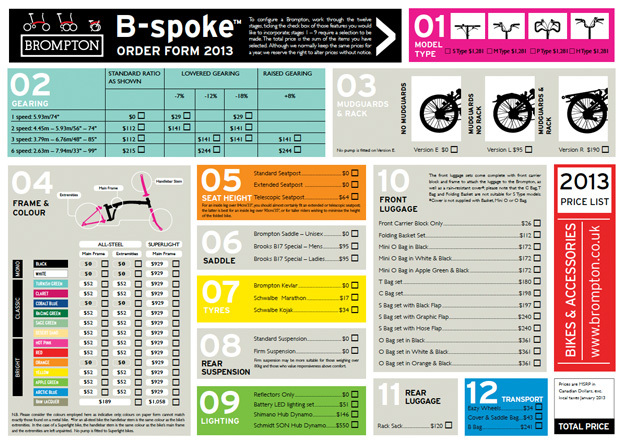 When ordering a Brompton, you fill out this form to get the exact bike you want. We scoured the internet for information on the pros and cons of various Brompton configurations, and made our choices. For the curious, I’ve detailed our decisions below. We both chose the S Type. Pier likes the look of them. I like the feel of them. I hate super upright rides, and even though the S Type are only an inch lower than the M Type, after lots of internet research I discovered that the S Type bars are also positioned an inch farther forward. It’s a tiny difference, but will make the ride just a little more aggressive and less upright. The only downside to the S Type is that they don’t fit the giant touring bag (tragically named the “T Bag”). We like to go fast. Brompton has an option on the 3 Speed and 6 Speed to gear them up 8%, so obviously we went for it! Pier likes simple so he was leaning towards the 3 Speed – less to go wrong, cleaner look, less cables, and we probably wouldn’t need more than three gears, right? I favoured the 6 Speed because its highest gear is faster than the 3 Speed and it has the lowest gears incase we go traveling in the mountains. But did we need such low gears? We decided to ask the guy at Curbside Cycle. He emphatically told us to get the 6 Speed so we’d be ready for any terrain. As an example, he told us his 3 Speed didn’t have low enough gears to get up Montmartre in Paris. And that’s a hill, not a mountain, so we’ll definitely need 6 Speeds. Here’s the handy chart in the Brompton brochure that shows the gear ratios. Note the much wider range of the 6 Speed. Pier loves clean and simple style, so he wanted no mudguards, but then he wouldn’t be able to ride in the rain and that is inconvenient. So he’s getting the mudguards. I’m the obsessively practical one, so I’m getting the mudguards and the rack so I can carry more stuff on my bike. This was easy. I’ve always wanted Claret. Done. Pier got simple black. We didn’t even consider the Superlight frame because the couple pounds it would save wasn’t worth the money to us. Standard. Neither of us are tall. Me: Standard. Pier: Brooks, because he’s hip like that. I was perfectly happy getting the Brompton Kevlar until Pier chose the speedy Kojak. Since I can’t have him going faster than me, I had to get the Kojak too. 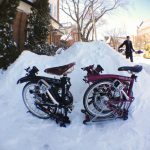 We were set to get Standard Suspension, but then I read about a couple touring the US on their Bromptons who switched to Firm Suspension because they found the Standard too squishy when carrying all their gear. Since we’ll be traveling with gear too, we got Firm Suspension. I’m getting the Battery LED lighting set. Pier is just going to use his MEC lights. Yes, I paid extra money to be lazy and not have to take my lights off my bike every time I fold it. This decision was the hardest. For traveling, the T Bag (hehe) carries almost twice as much as any of the other Brompton bags, so it would be the most practical, except it doesn’t fit with the S handlebars. Online research suggested that we could tie the brake/gear cables up and make it work, but we wanted to see for ourselves. So we went to the store to take a look at our options. Seems like the biggest problem with the T Bag is that the handle on the top is metal and gets in the way of the S handlebars’ brakes when you turn sharply. (Note: on a Brompton the bag doesn’t hang from the handlebars, it’s attached to the front frame, so the bag stays stationary while the handlebars turn, moving over it.) So we took a look at the S Bag and in person it was waaaaay smaller than it looked in the brochure. Then we checked out the O Bag, the most expensive option, and though it’s supposed to hold the same as the S Bag (20 litres) it just seems so much bigger. Must be the design. It is gorgeous, fully waterproof and seems capable of expanding more than the S Bag. And the two bags that attach to the back of the O Bag are also fully waterproof. So that’s what we got. Brompton comes with one rear luggage option, but it’s not very big. I’ll look into cheaper back rack bags elsewhere. We both got Eazy Wheels to more easily facilitate rolling our bikes around in what I call “cart” formation. We didn’t order the Cover or B Bag yet because we’re still researching the best way to fly with our Bromptons. So our Bromptons are ordered! They’ll arrive in two months! UPDATE: Coming soon… Five years later, are we still happy with the choices we made? I’ll tell you next week.